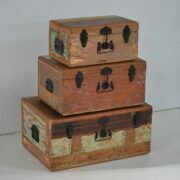 Low pastel trunk with carved front panel. 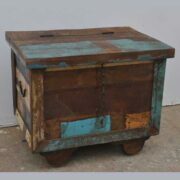 A lovely low trunk made from salvaged timber, with a solid lid and authentic carved sunburst design on the front panel. 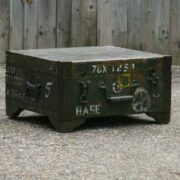 It is fairly rustic with a few dents here and there. 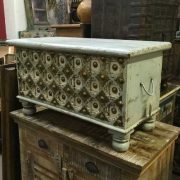 Finished in softly distressed pastel blues and greens, mixed with neutral tones, it’s a gorgeous trunk with space inside and plenty of charisma.